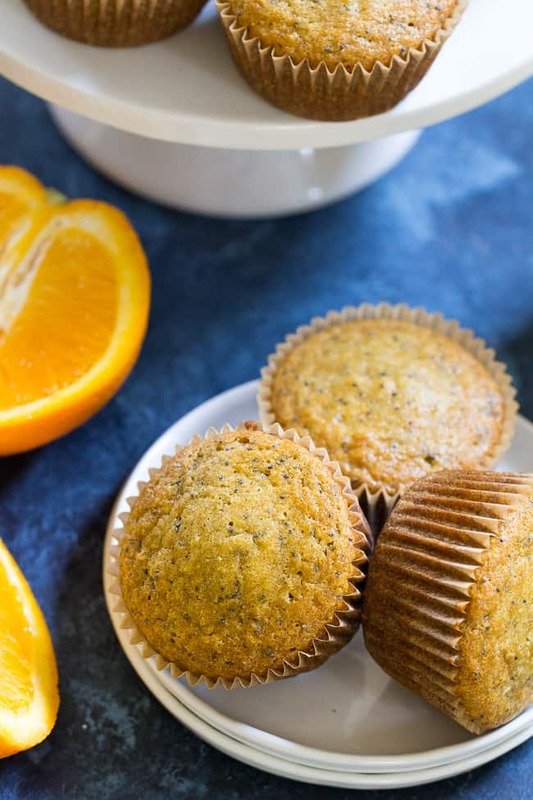 These orange almond poppy seed muffins are the perfect sweet addition to your breakfast and make great snacks too. Perfectly moist, sweet and packed with flavor and a hint of spice, you won’t believe they’re gluten free, dairy free, and paleo! One of my favorite flavor combos, ever, is basically anything along with almond extract. Okay, I guess that’s a whole lot of combinations, but you get the point – ALMOND EXTRACT 4 EVA! I understand that not everyone loves this flavor – I REALLY don’t understand why – but I respect it. This recipe, however, is for all you almond extract lovers out there. The marzipan fanatics (can’t promise magic, but still) the tricolor cookie daydreamers and pound cake inhalers. I think most pound cakes use almond extract? This is something I should really know. Don’t even ask why I haven’t attempted a paleo pound cake yet – I have no good excuse, besides fear, I guess. 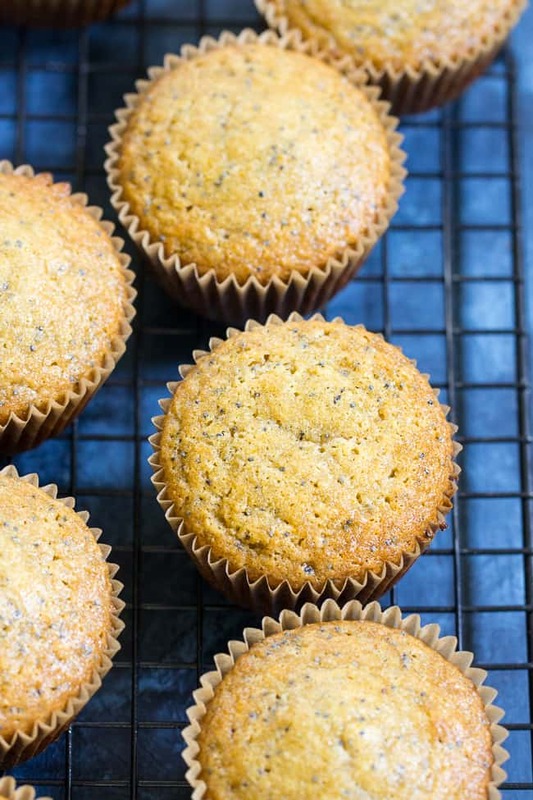 In the meantime, I have for you these orange almond poppy seed muffins. Not scary at all! And another “can’t believe it’s paleo” muffin recipes. I really do remember what “regular” muffins taste like too, so have faith, and trust these are DANG good muffins. 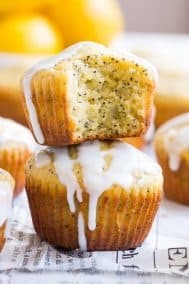 In the spirit of “if it ain’t broke…” I decided to slightly tweak one of my favorite coffee cake recipes to create these poppy seed muffins. The recipe is my cranberry orange coffee cake, and, it happens to be, quite possibly, my favorite of the coffee cake recipes on the blog. Anyway, I thought that I’d use the basic recipe for the coffee cake, scaled to make 12 muffins, add some poppy seeds, and see what happened. Luckily, good things DID follow! It’s always good to re-test a favorite recipe anyhow to make sure it actually IS as good as you remember it to be. Food blogger insecurity, I guess. 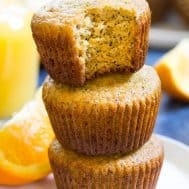 These orange almond poppy seed muffins have a great moist/soft texture and I added a bit of cinnamon and ginger for an added little punch of flavor. They’re dairy free, gluten free, grain free, and refined sugar free – sweetened with raw honey. 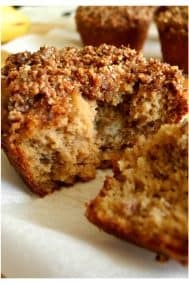 A perfect little addition to breakfast, or a great afternoon snack when you’re stuck in the car (muffins are my favorite for that!) I know you’ll love these, guys – let’s start baking!! 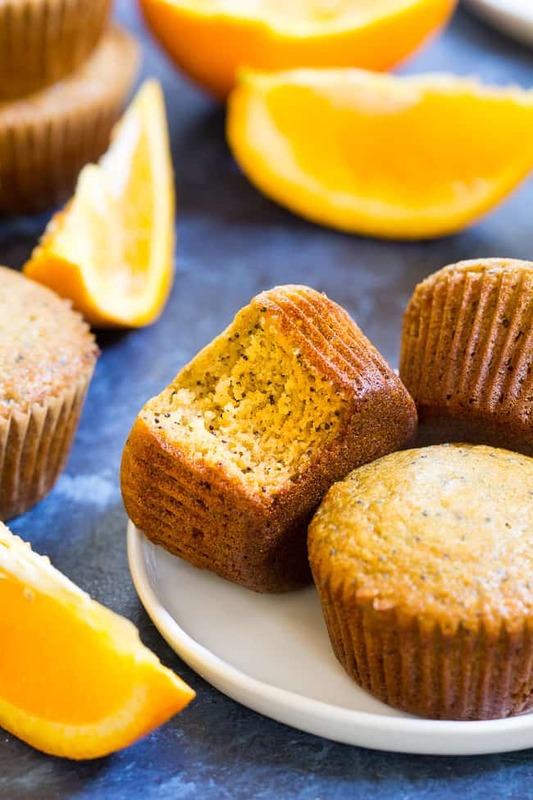 These orange almond poppy seed muffins are the perfect sweet addition to your breakfast and make great snacks too. Perfectly moist, sweet and packed with flavor and a hint of spice, you won't believe they're gluten free, dairy free, and paleo! Line a 12 cup muffin pan with liners and preheat your oven to 350 degrees. Using a hand mixer on low/medium or whisk, beat together the eggs, honey, orange juice, almond extract, coconut oil and zest. In a separate bowl, stir together the almond and tapioca flours, baking soda, salt, poppy seeds and spices. Add the dry ingredients to the wet and mix on low speed or by hand until just combined. Divide the batter evenly between the 12 lined muffin cups (about 3/4 full), and bake about 15 minutes or until a toothpick inserted in the center of one comes out clean. Allow muffins to sit in the pan for 2 minutes, then remove and cool completely on wire racks. Serve and enjoy! Leftovers can be stored in the refrigerator for up to 5 days or frozen. What’s your favorite recipe using almond extract? 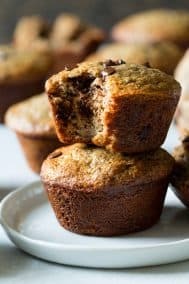 I’m curious; do you have any recipes that are cookies/muffins that don’t use eggs or don’t have to have eggs? I am so surprised our recipes use so much sugar. I thought Paleo was a low sugar diet. No poppy seeds listed in recipe How many do you use? I noticed the same thing. I’m going to find a similar sized recipe and get an amount from that. I’m thinking 2-4 tablespoons, though. I used 2 Tbsp sorry for the omission and thanks for letting me know! 2 tbsp sorry I left it out! I’m not really sure I’ve ever had almond extract before! I do love poundcake though, so that leads me to believe perhaps I have. Regardless, this recipe looks unique, simple, and delicious! Sorry it’s 2 tbsp, adding it now! Making these now – no seeds listed? could you suggest an amount of coconut flour to substitute instead of almond meal? Thank You! Coconut flour can be tricky but I’d say 2/3 cup based on a similar recipe I made, let me know how it goes! I didn’t have poppy seeds so I used chia instead. 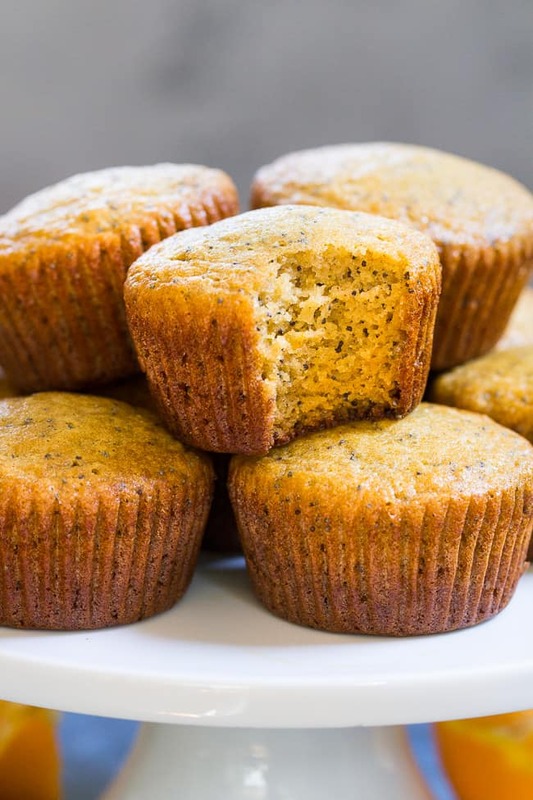 Chia is not the same flavor as poppy, but I really like the result of using the chia seeds in the muffin. A nice delightful muffin both in taste and moisture. I’ll be doing the same for the lemon muffins now. Great! Glad you liked it and that the chia worked 🙂 So much respect for you as an ultra marathoner – WOW! Could I use lemon juice and lemon zest in place of the Orange? Yes definitely, I would add just a bit less since lemon is so much more tart though. Let me know how it goes! Made these last night and my husband and I loved them! I am curious though if you have any idea how many calories are in each muffin?! I made these for the office and they were great! It’s nice that the recipe is so easy! You don’t even need the mixer! We loved these muffins. I am wondering if you think this recipe would work without the honey? Trying to cut back on sweetener. I am thinking maybe the combo of orange juice, almond flour and almond extract would feel sweet enough? 1 1/2cups almond flour. Yield = 10 muffins. I hope my tips help other home bakers.